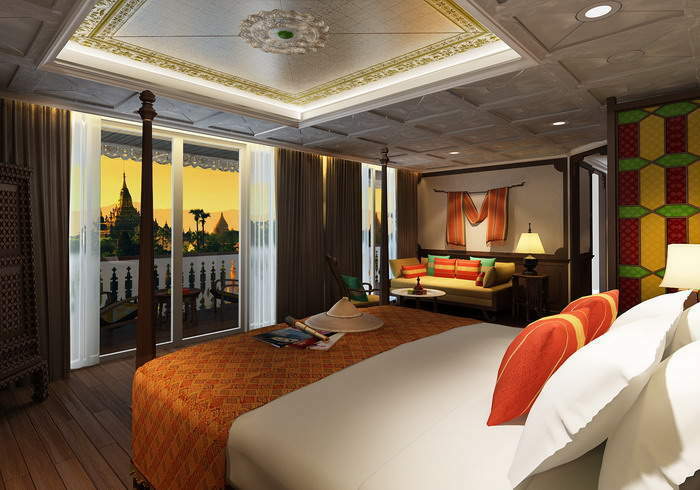 With the largest cabin space on the Ayeyarwady, and the highest crew to passenger ratio, The Anawrahta Cruise ofers the fnest on-board experience in Myanmar. This impressive vessel is named after the founder of the Burmese nation, modern day Myanmar. During his reign, from 1044-1077, he introduced and spread the religion of Theravada Buddhism throughout the land. King Anawrahta was born in 1014. His mother was Myaunk Pyinthe and his father, King Kuhshaw Kyaunghpyu was once the ruler of Pagan. His father was overthrown by his stepbrothers, Kyiso and Sokkate. Anawrahta upon coming of age and learning the betrayal of his father, challenged Sokkate to a duel and won, bringing back the crown to their family. King Anawrahta made Pagan the capital city of Burma, modern day Myanmar, he described it as the “city of a thousand temples” because of the numerous structures, temples and pagodas built around the city. King Anawrahta converted to Theravada Buddhism, the oldest and most traditional school of Buddhism that focuses on “the teaching of the Elders.” Blending the purity and serenity of King Anawrahta’s Buddhist beliefs with the opu- lence of the British Empire, The Anawrahta is the perfect vessel on which to explore Myanmar’s mighty Ayeyarwady River. 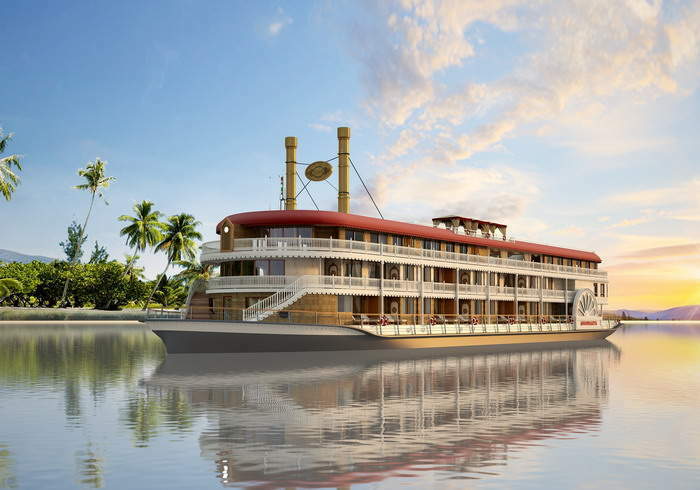 Built to resemble a British colonial paddle steamer, the elegant 65-meter/ 214 feet long Anawrahta features three spacious decks and 23 luxurious cabins. With its gleaming white rails, polished lacquer, intricately carved woodwork and shining brass, The Anawrahta takes guests back in time to an era of bygone elegance. 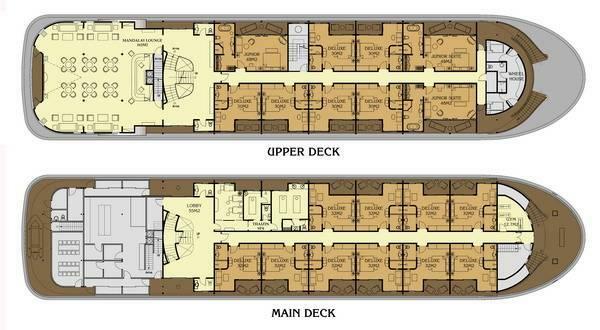 With just twenty-three artfully designed cabins, the Anawrahta ofers plenty of space to unwind. 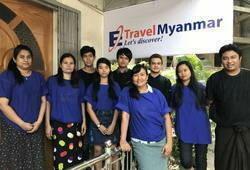 Exclusive, yet friendly, we have the highest crew to passenger ratio on the Ayeyarwady. Whether guests wish to enjoy private moments or socialize, the boat has a variety of memorable venues from which to enjoy and explore this unique river. Set on the Terrace Deck, the Kipling’s Bar is the perfect place to watch the world slip by as you enjoy your favorite wine or cocktail. With its high ceilings, large windows and colonial-style rattan chairs, Kipling’s Bar invites guests to relax and contemplate the passing river life. 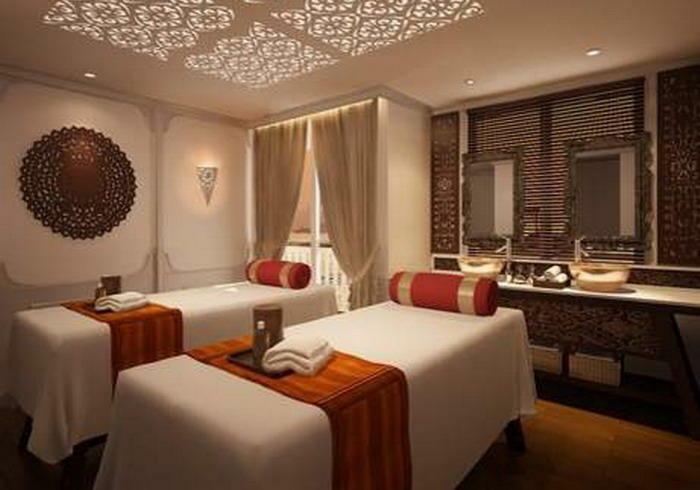 With colors inspired by local spices, the Kipling’s Bar is a spacious 157-square meters/ 1,690-square feet.. 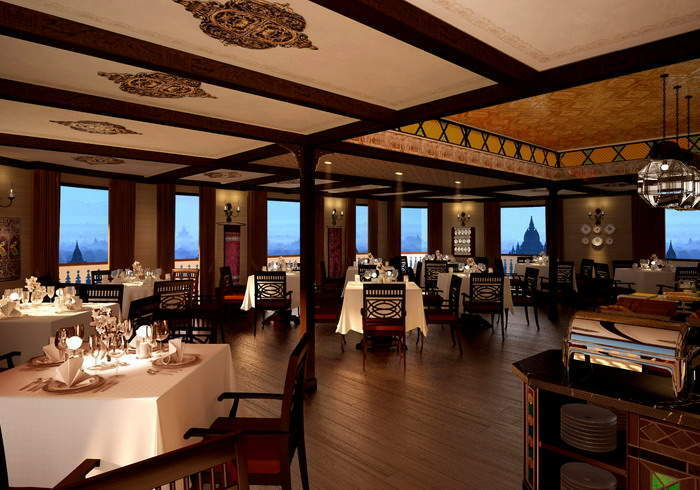 Inspired by the lavish decorations of old Bagan and Mandalay, the Anawrahta’s Hintha Hall Restaurant evokes the elegant dining halls of yesteryear. White tablecloths and gleaming glassware are surrounded by polished wood, intricately-carved floor and ceiling panels and - last but not least - stunning views, framed by large picture windows. 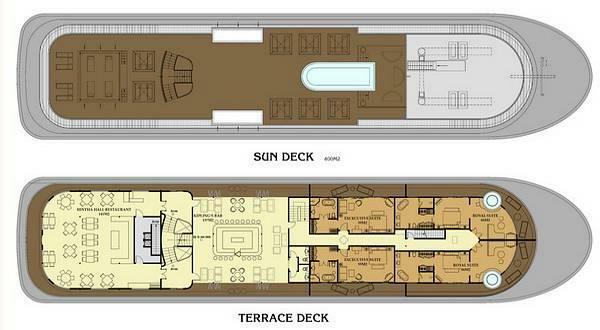 With seating for 48, the 141-square meter/ 1,518-square feet Hintha Hall lies on the Terrace Deck. “If you’ve ‘eard the East a-callin’, you won’t never ‘need naught-else. No! You won’t ‘eed nothing else But the spicy garlic smells, An’ the sunshine an’ the palm-trees an’ the tinkly Temple-bells…” -From “The Road to Mandalay”, Rudyard Kipling, 1890 While the Anawrahta is the perfect stage, the star of the show is the river. 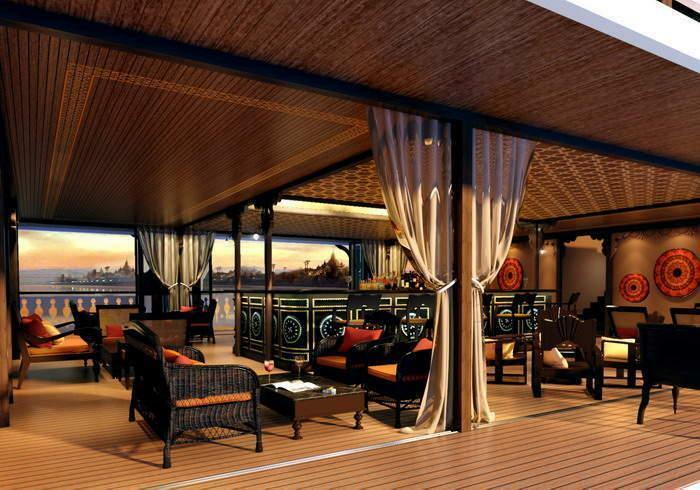 Rising early, you make your way to the sundeck, just as the first rays of gold touch the surface of the Ayeyarwady. A fisherman casts his net, throwing shimmering droplets into the morning light. After enjoying this unforgettable view - and a strong coffee - you are ready to join an open- air yoga or tai chi class. You pass all manner of other craft, from simple fishing canoes to boats crowded with fresh produce, household goods, giggling school children. Villagers come out to wave. Water buffaloes watch you warily. You keep a lookout for the river’s most famous residents, the Ayeyarwady dolphins. When it’s time for lunch you join your fellow guests in the Hintha Hall dining room, where waiters - who now greet you like an old friend - serve tantalizing dishes from throughout Burma. As you learn about the complex cuisine, you understand more about this nation’s cultural diversity. Sunset finds you and your friends in the Kipling’s Bar enjoying freshly- made cocktails - and freshly inspiring views. As the river turns from blue to violet, you understand Rudyard Kipling’s long-ago nostalgia: “If you’ve ‘eard the East a-callin’, you won’t never ‘need naught else. As well as ofering international favourites, the Anawrahta’s chefs take great pride in introducing their guests to the authentic favours of Burma. Infuenced by the cuisines of China, Thailand and India, Burmese food is as diverse as it is delectable. Thanks to its long coastline, seafood plays a prominent role, as do fresh herbs, aromatic spices and both highland and lowland vegetables. A typical Burmese meal involves steamed rice, a fsh or meat curry and a light soup. Salads, known as a thoke, are plentiful, as are imaginative condiments. Last but not least, the nation’s Buddhist culture has given rise to mouth-watering vegetarian options. Enjoy the comforts you’d expect in a fne resort on land with a waterfront view that’s constantly changing. When building the Anawrahta, we sourced materials, handicrafts and fne arts from the best artisans and artists throughout the country. The private staterooms and public venues showcase the talent of local artists, many of whom employ traditional skills passed down for generations. 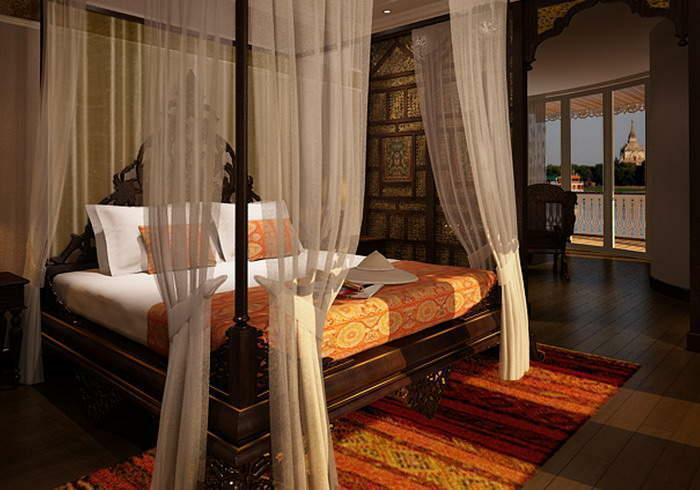 The Anawrahta’s sixteen beautifully appointed deluxe rooms are decorated with original handicrafts, locally-carved wood panels and richly-textured fabrics inspired by the brocade of Burma’s ethnic minority groups. Large windows and serene colors inspire total relaxation. Size: 32 square meters / 344 square feet. 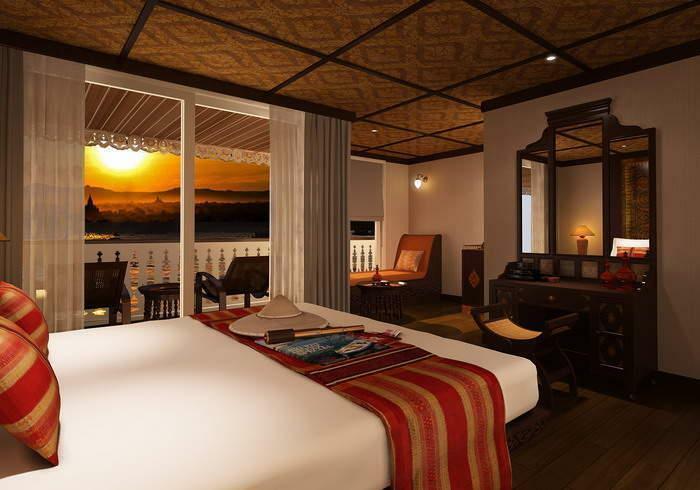 Named after some of the most fascinating rivers in Myanmar, the Anawrahta offers three Junior Suites: the Kaladan, the Lenya and the Thandi. 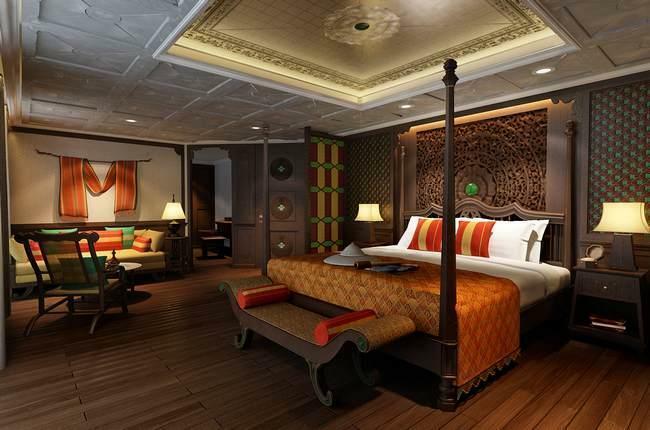 Combining dark, regal wood with the bright oranges, saffrons and greens of the floral offerings presented at temples, these suites offer a comfortable seating area and a private balcony from which to enjoy the lush beauty of the Ayeyarwady. Size: 48 square meters / 517 square feet.